A good poker player would never just think to themselves “Oh, that big bet means she probably has the best hand”, or “Maybe he’ll fold if I make a big bluff”. Instead, they’ll carefully think through all the information they have, evaluate the strength of each piece of evidence, and then come to some kind of probabilistic estimation. “She would make such a big bet around 70-80% of the time she has a big hand.” or “I expect he’ll fold around 33% of the time if I bluff here”. 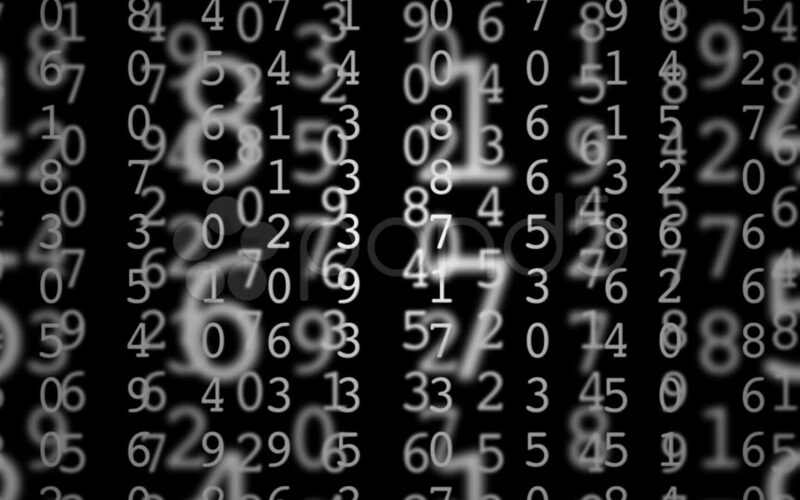 Quantification – the act of trying to measure something with numbers – is an integral weapon in a poker player’s thinking arsenal. If cultivated well, it provides additional accuracy and granularity that benefits decision-making enormously. Our strength of belief about an idea, concept or future event can only lie somewhere on line between 0% and 100% (and, according to Bayes Theorem, it can never actually reach 0 or 100, only approach them), and so the more we can mentally zoom in on that number line about something’s likelihood, the more accurately our beliefs will mirror reality. In other words: the world, much like poker, is effectively governed by the laws of chance and statistics. Yet through scientific thinking, we can use these probabilities to make remarkably accurate predictions about how the world will work. So it’s vitally important we train ourselves to think probabilistically if we want to achieve the best results over the long run. It’s also important to communicate probabilistically too. 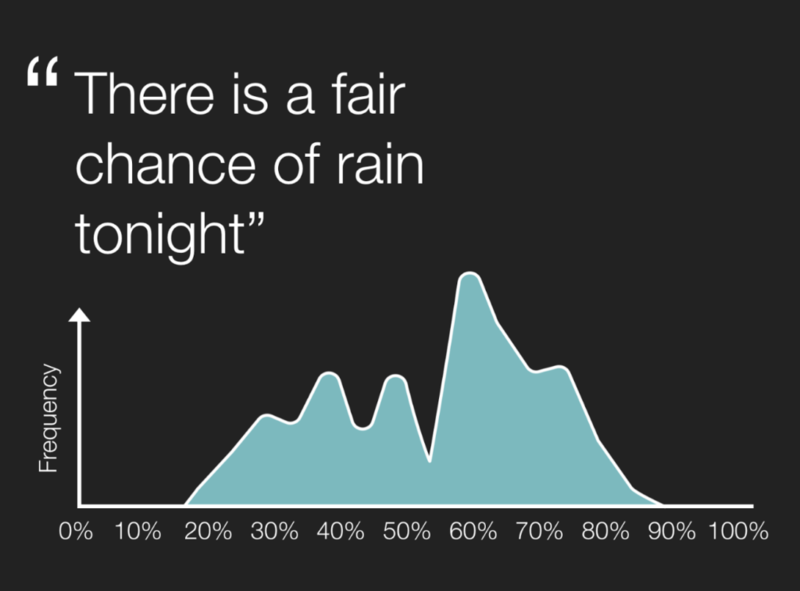 Check out the graph below – I asked my twitter followers what the first percentage that pops into their mind when told: “There’s a fair chance of rain tonight”. And this subjectivity can cause some serious blunders. According to some history texts, “a fair chance of success” were the exact words used by the Joint Chiefs of Staff to President Kennedy in 1961 when relaying their estimations of the success of a cuban invasion during the cold war. Military experts had predicted the success rate of overthrowing Castro via a ground invasion to be around three to one against – in other words, only a 25% of a mission actually succeeding. But instead of just relaying that number to Kennedy, the JCOS reportedly told him there was “a fair chance of success”. His interpretation was likely something much more positive than 25%, because he decided to launch the infamous Bay of Pigs ground invasion soon after, and we all know how badly that turned out. Over 1000 troops got captured, Castro grew more even more powerful, and Cold War tensions got a whole lot worse. Was this miscommunication the deciding factor that launched that fateful mission? Unclear. But either way, if the highest level intelligence agencies have made that kind of mistake in the past (and it happened again with Bush and the WMDs, according to this), it makes you wonder how much our fuzzy language is messing up our daily decision-making and communication. It could imply over-confidence in your estimation. If that’s a concern, by all means state a range of probability, say “I’m 50-80% to make it” – that’s still better information for them than leaving it undefined. If the other person continues to be unreasonable in their expectations, find more statistically literate friends. Often we say these fuzzy words to deliberately sow uncertainty and buy ourselves some wiggle room. I get ya – I’m a flake too. Just be aware when you’re doing it, as it can breed very bad thinking habits.